In the one way I am calculating the shortest distances between each point in dataset A (red points) and the nearest point in dataset B (blue points). The calculated distances are then used to find mean and standard deviation. In the other way I am doing a clustering before calculating distances. I am deviding my points in dataset A and in dataset B in regular grids. For each grid cell I am calculating the mean of z values of the points that fall in this cell because of their orthogonal projection. So I get two 2D grids where each cell contains the mean of differences in this cell. Instead of finding the shortest distances as before I now calculate the differences between each corresponding cells of dataset A and dataset B. 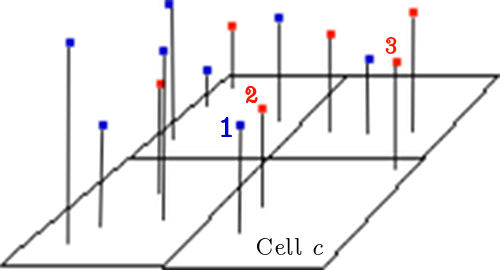 In the picture below cell c would contain z value of point 1 in grid A. And the mean of z values of point 2 and 3 in grid B. Then the distance would be calculated as the difference of the two cell values. Is there any way to check whether the results of the two ways of differences calculation can be compared? I thought of calculating the coefficient of variation but I am not sure if this is suitable and what it would really tell me. Browse other questions tagged standard-deviation spatial coefficient-of-variation or ask your own question. Poisson distribution sampling in 2D space with spatially varying intensity?